How Far Can Promotional Materials Go After Distribution? Home / Blog / How Far Can Promotional Materials Go After Distribution? With millions of products all vying for that valuable customer attention, entrepreneurs like you sometimes wonder why some businesses make it big while others barely make it to their third anniversary. If you want to make a longer-lasting impression and reach a wider range of new and prospective clients, then you have to look closely at your marketing strategies. Have you been exerting a lot of effort on maintaining a good online presence? If you answered yes, then that’s a great step in the right direction. The World Wide Web is a good avenue for making consumers aware that you exist. Have you invested in promotional items that you can give away on new product launches, holidays or similar events? If you answered no, then it’s about time to rethink your strategies. Why? Statistics show that including a promotional product or two in a company’s media mix increased customer awareness for their brand by almost 70% while 84% had a good impression towards their product. But why invest cash on promotional products when you can engage customers and increase brand awareness through social media sites which do not cost as much? 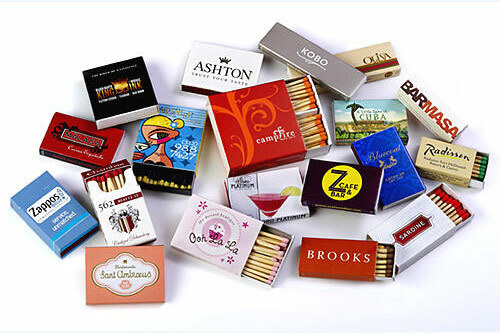 Why spend your hard-earned cash on promo materials like matchbooks, toothpicks, notepads, Kleenex, bags, coasters and so on? The quick answer is – recall. Yes, you can post your ads and offers on Facebook or Twitter, but without something tangible that customers can hold on to, your chances of being remembered by them is very slim, considering the wealth of brands that post on social media sites on a daily basis. In fact, almost 90% of consumers recall the brand name on a promo product they received within the year. So if you had a hundred customers, you can expect 90 of them to remember you and probably do business with you. The same survey revealed that 47% of consumers keep promotional items for more than a year while 53% use those products every week or even on a more frequent basis. This means that more or less than 50% of your customers will keep your matchbooks, toothpicks, notepads, Kleenex, bags, coasters and so on for the next 12 months or use them within the week after distribution. Another significance of promotional materials is that these can help you reach more customers without spending extra cash. Matchboxes can be passed from one collector to another; Kleenex can be given to a friend who needs it; and notepads can be used for listing groceries and many others, be seen by store managers, cashiers and other customers. So, if you haven’t considered spending for some promotional materials, maybe it’s time to rethink your marketing strategies.